When I was a kid, Gatas ng Kalabaw (Carabao’s Milk) was a commonplace thing at home. While we lived in the city, my grandmother had a suki (regular supplier) who would deliver bottles of the milk, fresh from Pampanga. We’d receive the milk in mismatched, long-necked glass bottles, stoppered with a rolled up wad of banana leaf. Richer and creamier than cow’s milk, it feels thicker to the tongue—I don’t know if it’s the actual texture or if it just feels that way because of the taste. Despite the frequent encounters I had with it during childhood though, the number of times I’ve drunk it can be counted with my hands because it was something we saved for pouring on hot rice. My grandmother would give me a shallow bowl of piping hot, freshly cooked rice which I’d then douse with copious amounts of carabao milk. I would then sprinkle it with some rock salt and dig in. Some people like pairing this with dried fish. My mom likes it with Halabos na Hipon (steamed shrimp). 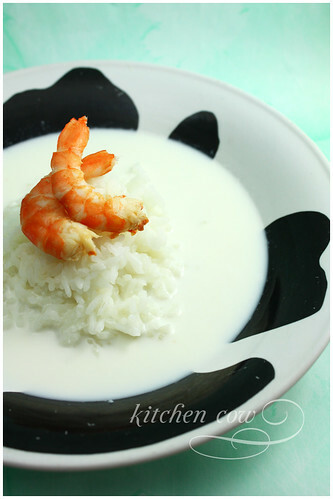 Personally, I like it plain, letting the cool milk heat up, meeting the temperature of the hot rice halfway. The rich milk flavor is cut by the bland rice, with a hint of salt contrasting sharply against the naturally sweet milk. Because of the soupy texture and lack of any other ingredient, it’s easy and comforting to eat, much like a bowl of hot porridge on a cold day. I just keep stuffing spoonful after spoonful in my mouth. These days, we’d occasionally buy bottled carabao’s milk during food fairs or from specialty markets. Unlike the leaf stoppered bottles from the old days, we’d get sleek plastic bottles with sealed caps—much like commercially marketed cow’s milk. It’s now UHT pasteurized, adding to the shelf life, making it safer to ingest as well. Still, despite all the modern improvements, I still see it as the same bottle of carabao’s milk I grew up with. A bottle of creamy goodness doused on rice, warming my hungry tummy, spelling comfort and a shiny, bright new day to explore. This entry was posted in food spotlight and tagged carabao, carabao milk, gatas ng kalabaw, milk, rich milk, sweet milk. Bookmark the permalink. i actually love gatas ng kalabaw on rice 😀 i rarely get to have it though. We usually buy from DTRI in UPLB… They have the plain carabao milk then a chocolate milk flavor… Yum! I wanna try your way. One of my favorite comfort food. My mom still has a suki she gets this from. I particularly like the thick film that forms on top after the milk cools down after its been boiled. I usually put fruits like mangoes or strawberries with the bit of rice when we have this at home. It’s yummy! Darn. I wonder if I could get any in the US? But it wouldn’t be nice to my lactose-hating tummy but my mouth and brain would love it so it’s two against one. I’ve seen several small kiosks in some malls selling Gatas ng Kalabaw.. I can’t quite remember exactly but I think the store’s name is Gatas ng Kalabaw. I tried buying some before but I always find the plain carabao milk sold out. I should try again! Looks yummy! I’ve NEVER tried this but have always been intrigued. There are commercially available carabao’s milk but I don’t know how to do it right, pouring it over hot rice or something. One of these days I’ll give it a whirl. Diba? What else do you eat with it? Daing? There’s one we buy at SM Makati when they have their weekend food thingie. Dun sa gitna? We buy Friday nights after work. Oooh! I imagine it would be good with mangoes. Hehe, do you eat ripe mangoes with rice too? My lola taught me that as well, hehe. Must try s’ya! The rock salt brings out the sweetness of the milk even more. I hope you get to try some soon! Masarap s’ya talaga.